The Belgian national football team has officially represented Belgium in association football since their maiden match in 1904. The squad is under the global jurisdiction of FIFA and is governed in Europe by UEFA—both of which were co-founded by the Belgian team's supervising body, the Royal Belgian Football Association (RBFA). Periods of regular Belgian representation at the highest international level, from 1920 to 1938, and 1970 to 2002, have alternated with mostly unsuccessful qualification rounds. Most of Belgium's home matches are played at the King Baudouin Stadium in Brussels. Belgium's national team have participated in three, quadrennial major football competitions. They appeared in the end stages of twelve FIFA World Cups and four UEFA European Football Championships, and featured at three Olympic football tournaments, including the 1920 Olympic tournament which they won. Other notable performances are victories over four reigning world champions—West Germany, Brazil, Argentina and France—between 1954 and 2002. 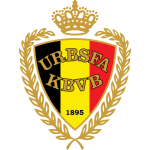 Belgium has longstanding football rivalries with its Dutch neighbours and its French counterparts, having played both teams nearly every year from 1905 to 1967. The squad has been known as the Red Devils since 1906; its supporters' group is named 1895. During the national player career of forward Paul Van Himst, the most-praised Belgian footballer of the 20th century, Belgium took third place at Euro 1972. After that, the national squad experienced two golden ages with many gifted players. In the first period, which lasted from the 1980s to the early 1990s, the team finished as runners-up at Euro 1980 and fourth in the 1986 World Cup. In the second, under guidance of Marc Wilmots in the 2010s, Belgium topped the FIFA World Rankings for the first time in November 2015.